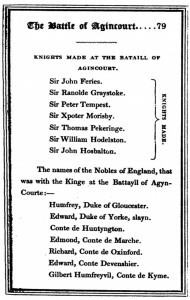 It was Peter III, the last of the de Brus of Skelton branch, who brought William de Pickering to Westmorland to serve as constable and later steward on his estates in Kendale. 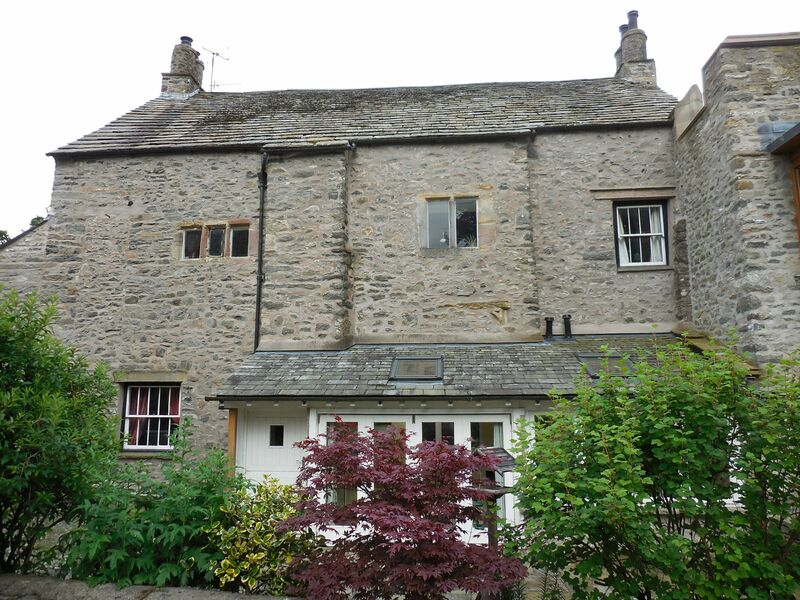 In c1260 he enfeoffed William of his late brother’s manor of Killington, together with Firbank, and Killington manor was to remain in the Pickering family continuously until 1582, when Anne, the last representative of the senior Pickering line, died. Ruth Margaret Blakely thinks it possible that William de Brus, the younger son of Adam I, may have given rise to the Pickerings of Killington and that William de Pickering was probably drawn from this junior line (see Origins). 1. 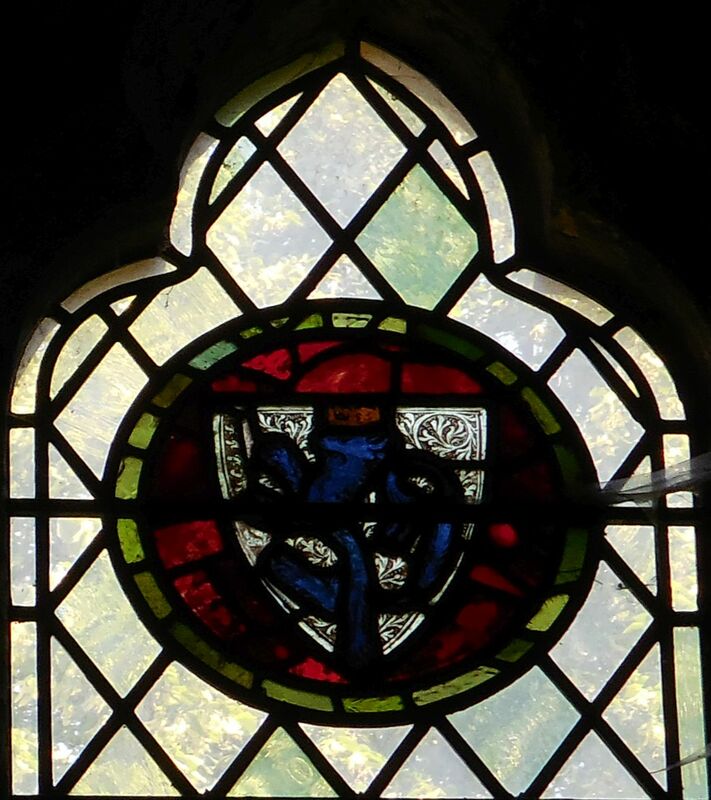 William de PICKERING steward of estate of Killington, born c1230 probably Pickering, North Riding of Yorkshire, died before 1279 Killington, Westmorland, married Unknown UNKNOWN. 1.1. 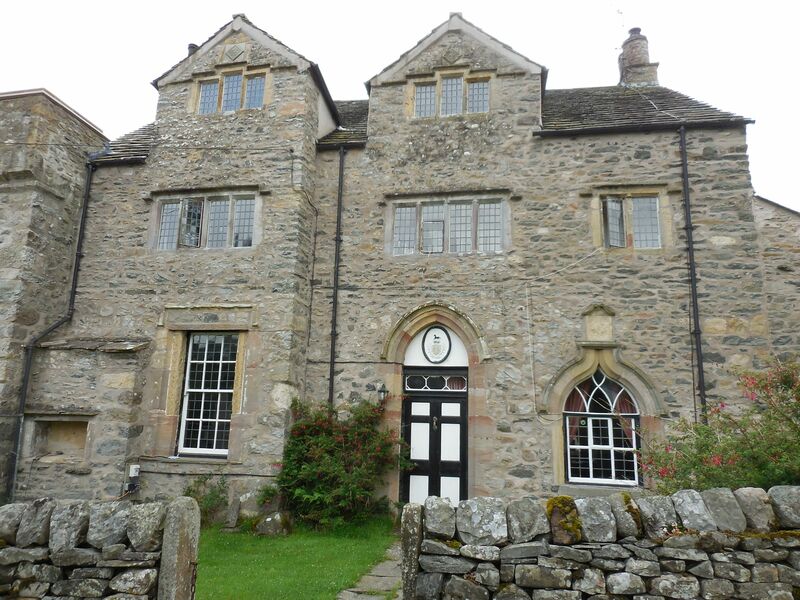 Sir Thomas PICKERING knight, born c1255 Killington, Westmorland, died c1340, married Elizabeth of GREYSTOKE, born c1265, died after 1328. 1.1.1. 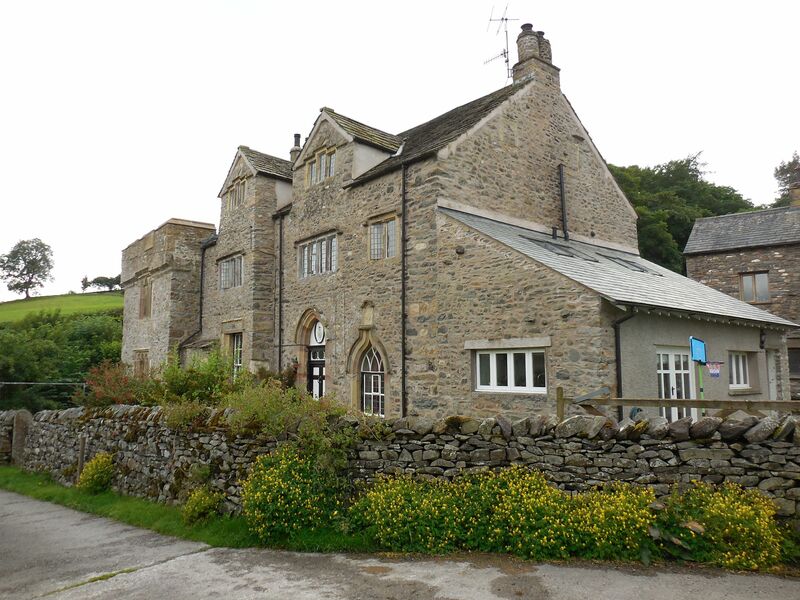 Robert de PICKERING born c1290 Killington, Westmorland, married Maud UNKNOWN. 1.1.2. Alice de PICKERING married Peter BEKARD. 1.1.1.1.1. Thomas de PICKERING died 25 August 1406 Ellerton, East Riding, buried Ellerton Priory, married Katharine UNKNOWN. 1.1.1.1.2. 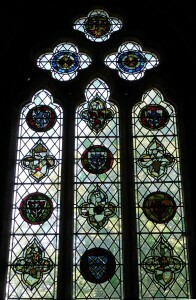 Joan de PICKERING married Christopher MORESBY born c1360. 1.1.1.1.3. William de PICKERING clergyman. 1.1.1.1.2.1. 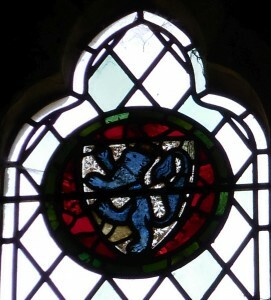 Margaret PICKERING married 1411 Hugh de LAMPUGH. 1.1.1.1.1.1.1. 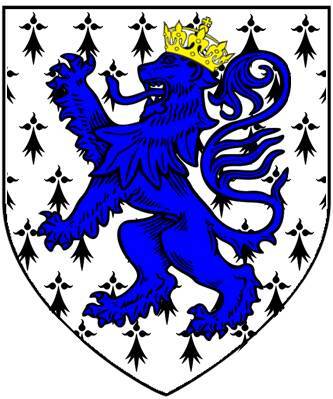 Sir James I PICKERING knight, born 29 August 1413 Killington, Westmorland, died c1476, married 1st Mary LOWTHER (daughter of Sir Robert LOWTHER), married 2nd Margaret NORWOOD (daughter of Sir John NORWOOD). 1.1.1.1.1.1.6. 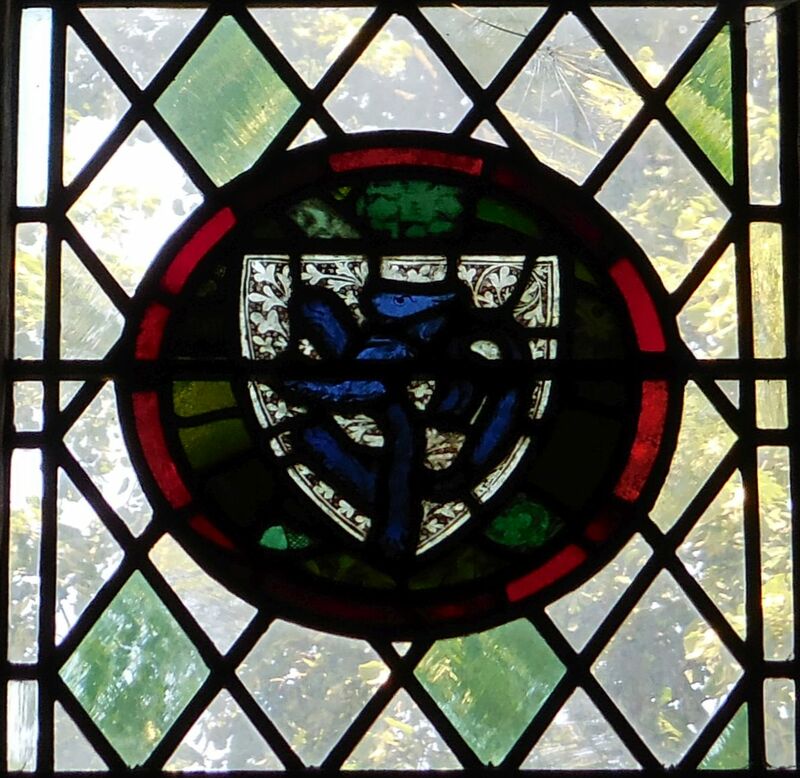 Alice PICKERING married Thomas PALMES esquire, died September 1433. 1.1.1.1.1.1.1.1. 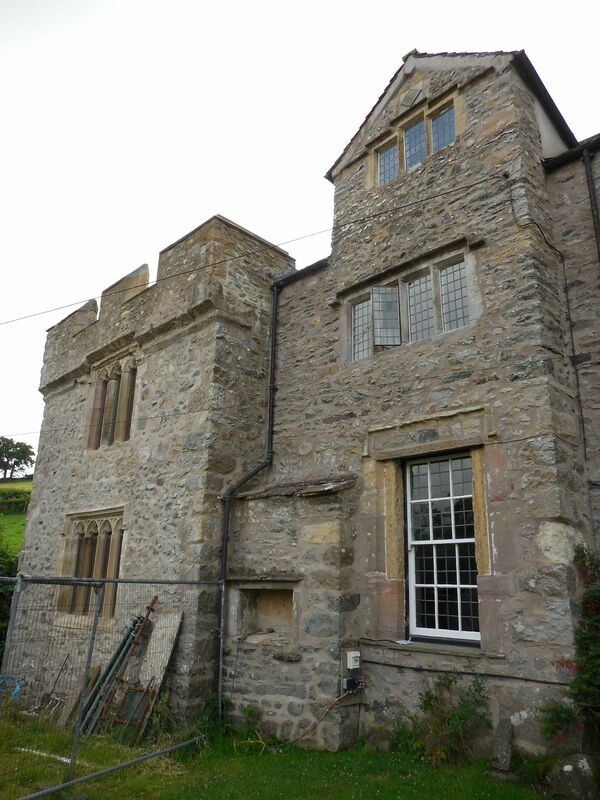 James II PICKERING esquire, born Harrington, Cumberland, died c1461, married Margaret LASCELLES died 17 November 1499. 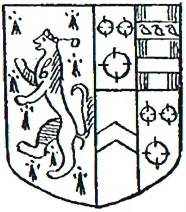 The family has ever since quartered the arms of Lascelles with their paternal arms. 1.1.1.1.1.1.1.2. 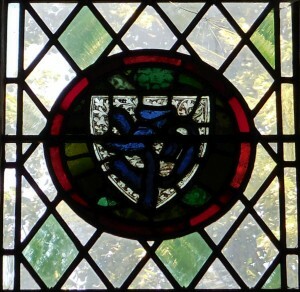 Sir Edward PICKERING knight, steward of Holt, Broomfield, Yale and Chirk castles, Denbighshire, married Joan MASSY (daughter of Sir Geoffrey MASSY). 1.1.1.1.1.1.1.1.1. 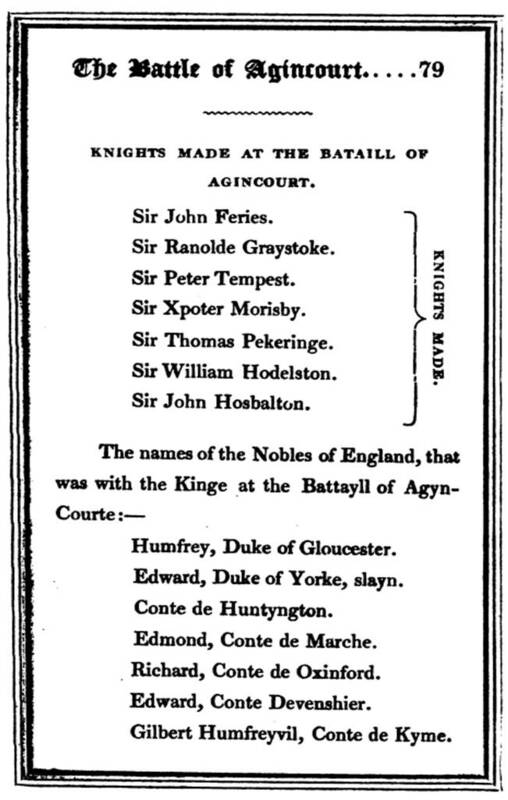 Sir James III PICKERING knight, born before 1443, married Anne MORESBY (daughter of Sir Christopher MORESBY). 1.1.1.1.1.1.1.1.2. John PICKERING married Agnes UNKNOWN. 1.1.1.1.1.1.1.1.3. 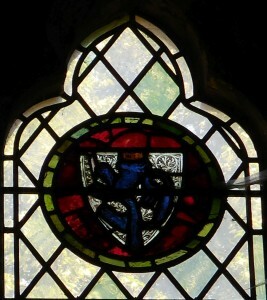 Margaret PICKERING married Sir William STAPLETON (son of Sir John STAPLETON of Wighill) died 1503. 1.1.1.1.1.1.1.2.2. John PICKERING porter of Holt Castle, Denbighshire, Wales, married Unknown UNKNOWN. 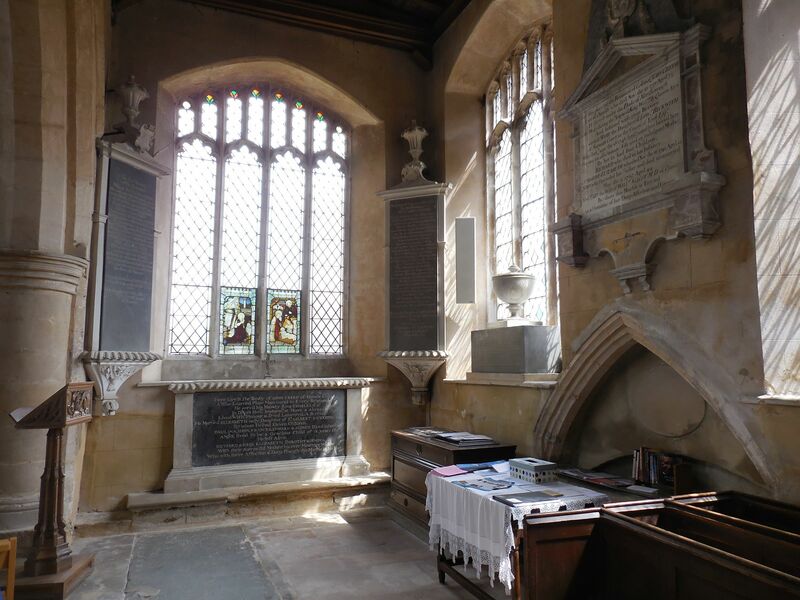 1.1.1.1.1.1.1.1.2.1 John PICKERING living Gretton, Northamptonshire, 1495, married 1st Unknown UNKNOWN, married 2nd Eleanor COLLEY born Glaston, Rutland, married 3rd Elizabeth RAND. 1.1.1.1.1.1.1.2.2.1. Sir John PICKERING landholder between 1547 and 1558 Hem, Denbighshire, Wales, married Unknown UNKNOWN. 1.1.1.1.1.1.1.1.2.1.1. John PICKERING husbandman, living Stoke Dry, Rutland, 1495. 1.1.1.1.1.1.1.1.2.1.2. Gilbert PICKERING died 1556 Titchmarsh, Northamptonshire, married Elizabeth STANBANK (daughter of James STANBANK) born Northamptonshire. 1.1.1.1.1.1.1.1.2.1.3. 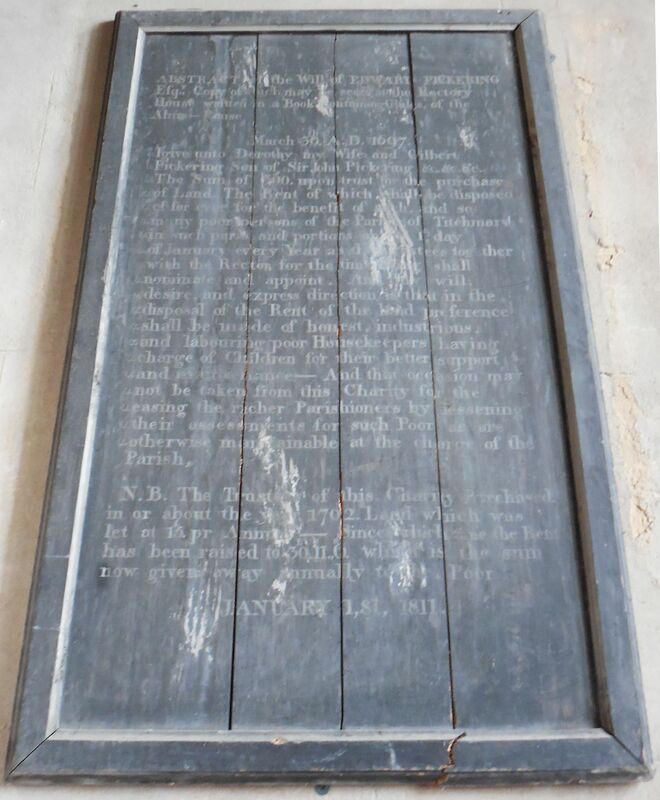 William PICKERING died c1542 Titchmarsh, Northamptonshire, married Agnes UNKNOWN. 1.1.1.1.1.1.1.1.2.1.5. Elizabeth PICKERING married Thomas MAYE born London. 1.1.1.1.1.1.1.1.2.1.6. Joan PICKERING married George PURCELL skinner, born London. 1.1.1.1.1.1.1.2.2.1.1. Francis PICKERING Mayor of Holt, died 3 September 1635 Holt, married Margaret WORRALL. 1.1.1.1.1.1.1.2.2.1.2. 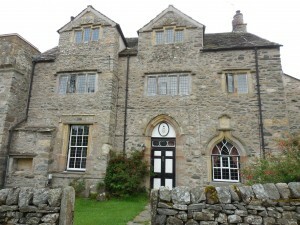 Elizabeth PICKERING married John ALFORD of Holt, Denbighshire, Wales. 1.1.1.1.1.1.1.1.2.1.2.1. 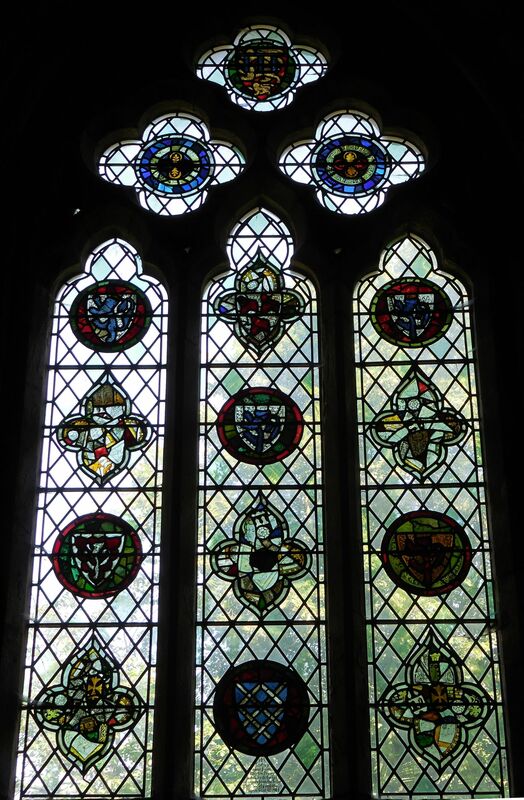 John PICKERING born Titchmarsh, Northamptonshire, died 1591 married 1st Lucy KAYE (daughter of Edward KAYE) born Woodsome, West Riding of Yorkshire, married 2nd Ursula OXENBRIDGE (daughter of Thomas OXENBRIDGE) born Sussex. 1.1.1.1.1.1.1.1.2.1.2.2. 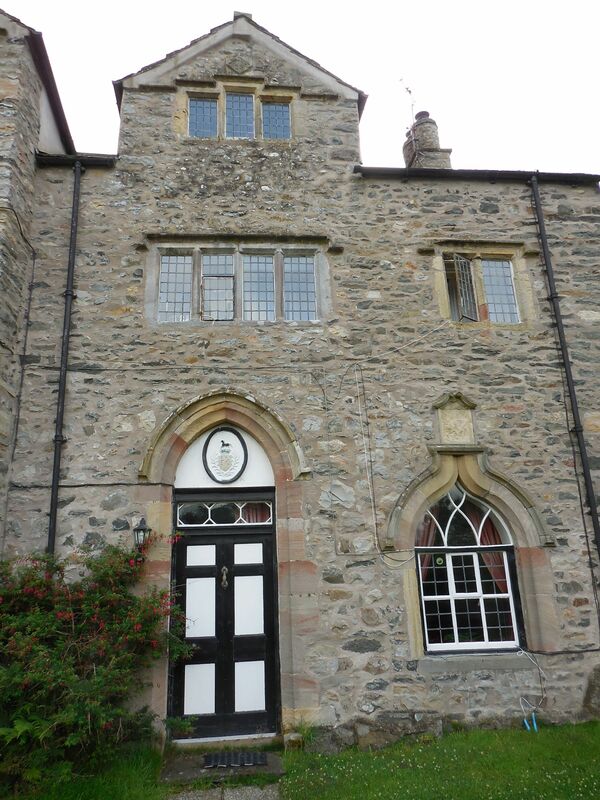 James PICKERING married Catherine HANMER (daughter of John HANMER) born Hanmer, Flintshire, Wales. 1.1.1.1.1.1.1.1.2.1.2.3. 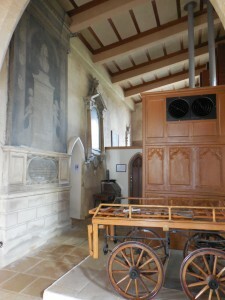 Boniface PICKERING died 1585 married Catherine ROLFE born Hertfordshire. 1.1.1.1.1.1.1.1.2.1.2.4. Mary PICKERING married Henry DAYE born Thrapston, Northamptonshire. 1.1.1.1.1.1.1.1.2.1.2.5. Joan PICKERING married John COOK born Glapthorn, Northamptonshire. 1.1.1.1.1.1.1.1.2.1.3.1. Richard PICKERING married Anne SEYTON (daughter of Thomas SEYTON) born Seyton, Rutland. 1.1.1.1.1.1.1.2.2.1.1.1. Francis PICKERING died after 1656 Holt. 1.1.1.1.1.1.1.1.2.1.2.1.1. 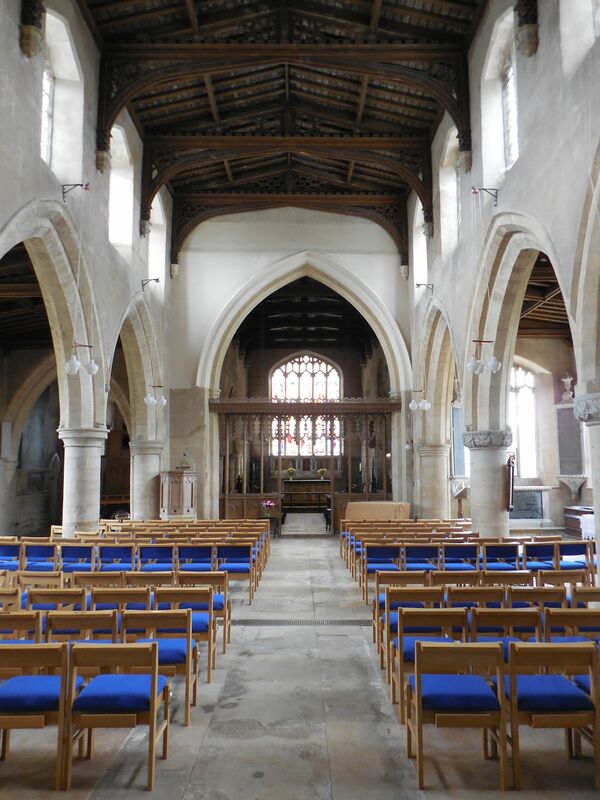 Sir Gilbert PICKERING born Titchmarsh, Northamptonshire, died 1613 married Elizabeth HOGARD (daughter of John HOGARD) born Bourn, Cambridgeshire. 1.1.1.1.1.1.1.1.2.1.2.2.1. 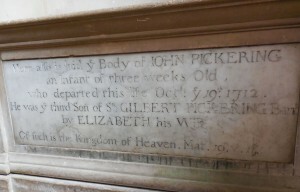 Edith PICKERING married William BERIE born Ashwell, Rutland. 1.1.1.1.1.1.1.1.2.1.2.3.3. Michael PICKERING married Unknown UNKNOWN. 1.1.1.1.1.1.1.1.2.1.1.1.1. Sir John PICKERING knight, Member of Parliament, born 1585 Titchmarsh, Northamptonshire, died 29 January 1628 Titchmarsh, Northamptonshire, married c1609 Susannah DRYDEN (daughter of Sir Erasmus DRYDEN). 1.1.1.1.1.1.1.1.2.1.1.1.1.1. Sir Gilbert PICKERING “Fiery Pickering”, High Chamberlain to Cromwell, one of the judges of Charles I, 1st baronet, Member of Parliament, born March 1611, died October 1668 Titchmarsh, married 1st Elizabeth MONTAGUE (daughter of Sir Sydney MONTAGUE and Paulina PEPYS) born Hinchingbrooke, Huntingdonshire, married 2nd Elizabeth PEPYS (daughter of John PEPYS) born Cottenham, Cambridgeshire, died 1679. 1.1.1.1.1.1.1.1.2.1.1.1.1.2. 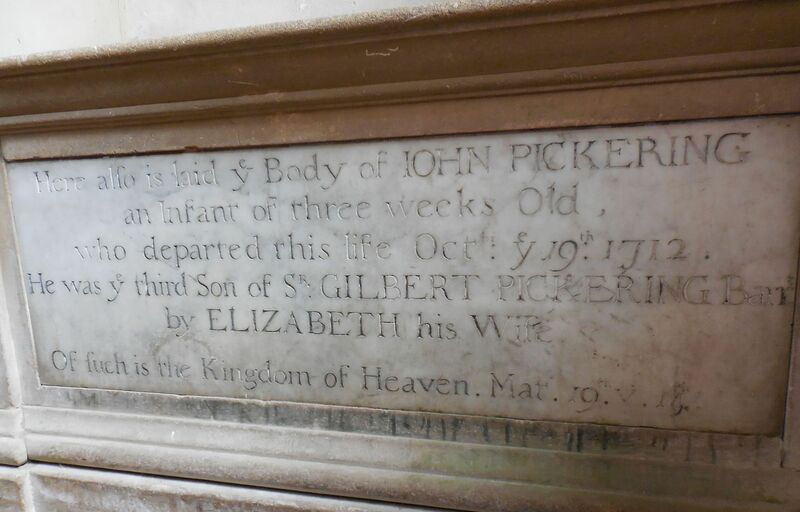 John PICKERING soldier, died November 1645 Ottery St. Mary, Devon, unmarried. 1.1.1.1.1.1.1.1.2.1.1.1.1.3. 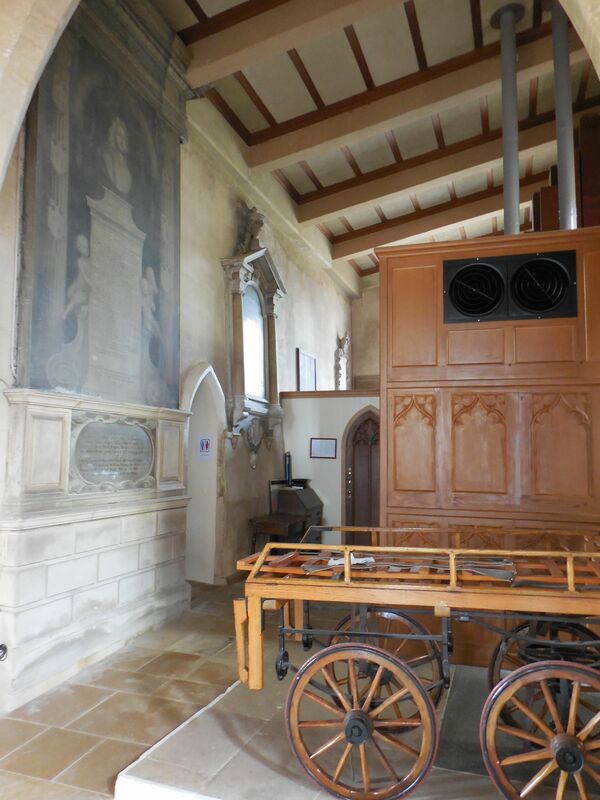 Edward PICKERING born 1617, died 1698 married Dorothy WELD (daughter of John WELD) born Middlesex. 1.1.1.1.1.1.1.1.2.1.1.1.1.4. Frances PICKERING died an infant. 1.1.1.1.1.1.1.1.2.1.1.1.1.5. James PICKERING died an infant. 1.1.1.1.1.1.1.1.2.1.1.1.1.6. 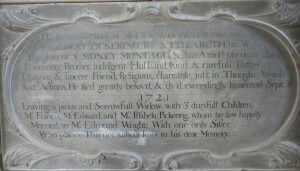 Elizabeth PICKERING died an infant. 1.1.1.1.1.1.1.1.2.1.1.1.1.1.1. Sir John PICKERING 2nd baronet, born 1640, died 3 April 1703, buried Titchmarsh, married Frances ALSTON (daughter of Sir Thomas ALSTON and Elizabeth ST. JOHN) buried Titchmarsh. 1.1.1.1.1.1.1.1.2.1.1.1.1.1.2. Elizabeth PICKERING born Titchmarsh, Northamptonshire, married 1668 Titchmarsh, Northamptonshire John CREED gentleman, born Oundle, Northamptonshire, died 1701. 1.1.1.1.1.1.1.1.2.1.1.1.1.1.3. Frances PICKERING died young. 1.1.1.1.1.1.1.1.2.1.1.1.1.1.4. Gilbert PICKERING Navy Lieutenant born c1645, married Elizabeth PINCHON (daughter or widow of Thomas PINCHON). 1.1.1.1.1.1.1.1.2.1.1.1.1.1.5. 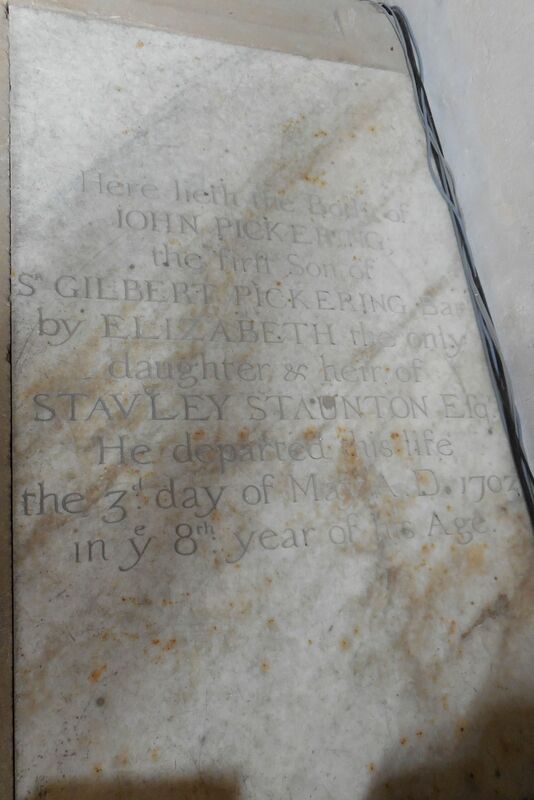 Sydney PICKERING merchant, born c1647, died before 1681, married his cousin Honor PICKERING (daughter of Sir Henry PICKERING and Philadelphia DOWNING) born 1673 Whaddon, Cambridgeshire. 1.1.1.1.1.1.1.1.2.1.1.1.1.1.6. 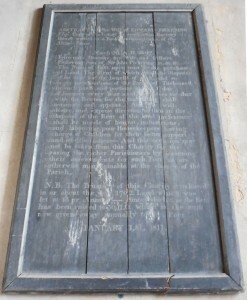 Oliver PICKERING died before 1697, buried Titchmarsh. 1.1.1.1.1.1.1.1.2.1.1.1.1.1.7. 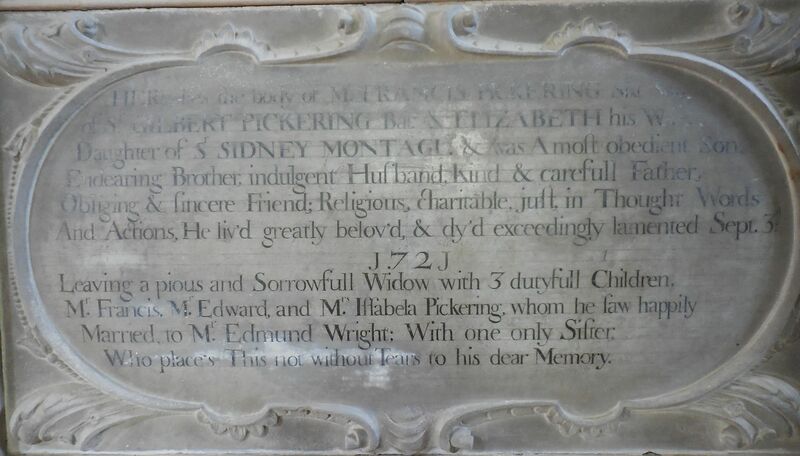 Montague PICKERING died 1691, married Elizabeth ALSTON (daughter of Sir Thomas ALSTON and Elizabeth ST. JOHN) born Odell, Bedfordshire. 1.1.1.1.1.1.1.1.2.1.1.1.1.1.8. Francis PICKERING merchant, died before 1697, married Portugal Joanna von DER HOUST (daughter of Unknown von DER HOUST). 1.1.1.1.1.1.1.1.2.1.1.1.1.1.9. 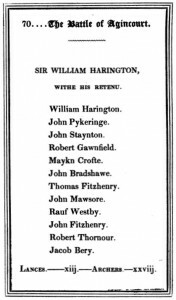 Theophilus PICKERING born c1662. 1.1.1.1.1.1.1.1.2.1.1.1.1.1.10. Anne PICKERING died young. 1.1.1.1.1.1.1.1.2.1.1.1.1.1.11. Mary PICKERING died young. 1.1.1.1.1.1.1.1.2.1.1.1.1.1.12. Lewis PICKERING died young. 1.1.1.1.1.1.1.1.2.1.1.1.1.3.1. Dorothy PICKERING died young. 1.1.1.1.1.1.1.1.2.1.1.1.1.1.1.1. 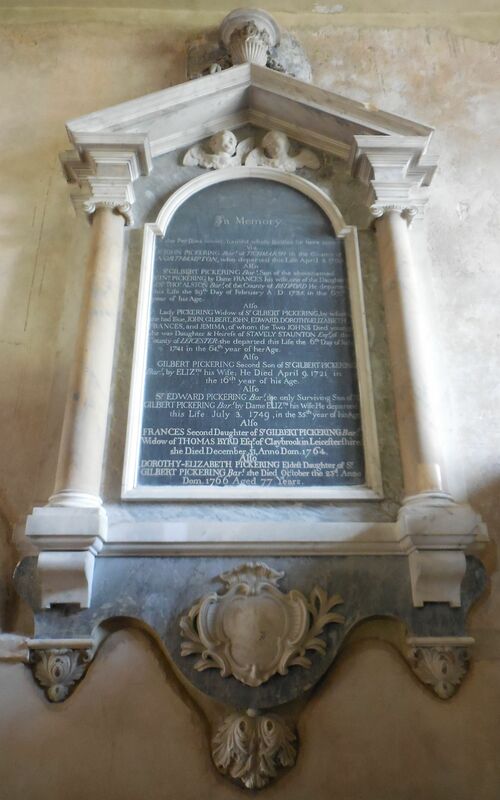 Sir Gilbert PICKERING 3rd baronet, born 1668 Titchmarsh, Northamptonshire, died 29 February 1736, married 1691 Elizabeth STAUNTON (daughter of Staveley STAUNTON and Elizabeth ALSTON) born 1677, died 6 June 1741, buried Titchmarsh. 1.1.1.1.1.1.1.1.2.1.1.1.1.1.1.2. John PICKERING died an infant. 1.1.1.1.1.1.1.1.2.1.1.1.1.1.4.1. Elizabeth PICKERING born 1669 London, married Thomas DILLINGHAM. 1.1.1.1.1.1.1.1.2.1.1.1.1.1.4.2. Sir Gilbert PICKERING 5th baronet, born c1690, died before 1763, married Anne FRANKS died 1762. 1.1.1.1.1.1.1.1.2.1.1.1.1.1.7.1. Edward PICKERING born 1681, died 1703. 1.1.1.1.1.1.1.1.2.1.1.1.1.1.8.1. Francis PICKERING died before 1765, married Lucretia UNKNOWN. 1.1.1.1.1.1.1.1.2.1.1.1.1.1.1.1.1. John PICKERING born 1695, died 3 May 1703 Titchmarsh. 1.1.1.1.1.1.1.1.2.1.1.1.1.1.1.1.2. Gilbert PICKERING born 1705, died 09 April 1721, buried Titchmarsh. 1.1.1.1.1.1.1.1.2.1.1.1.1.1.1.1.3. 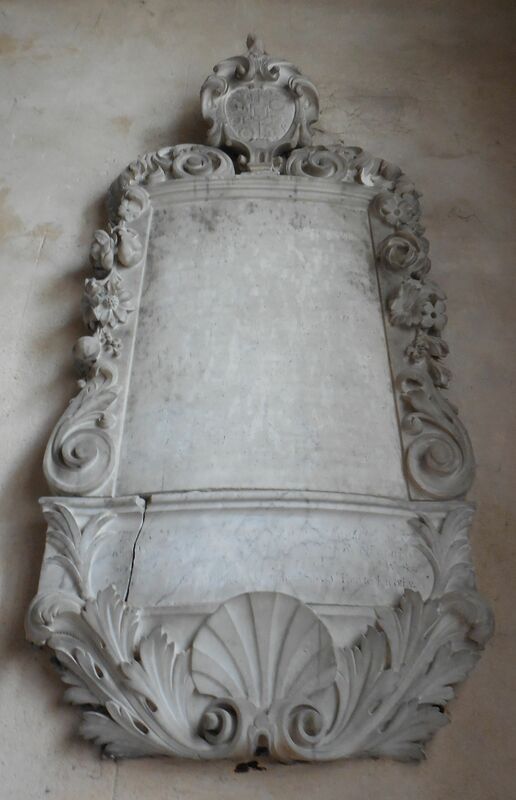 John PICKERING born 1712, died 19 October 1712 Titchmarsh. 1.1.1.1.1.1.1.1.2.1.1.1.1.1.1.1.4. 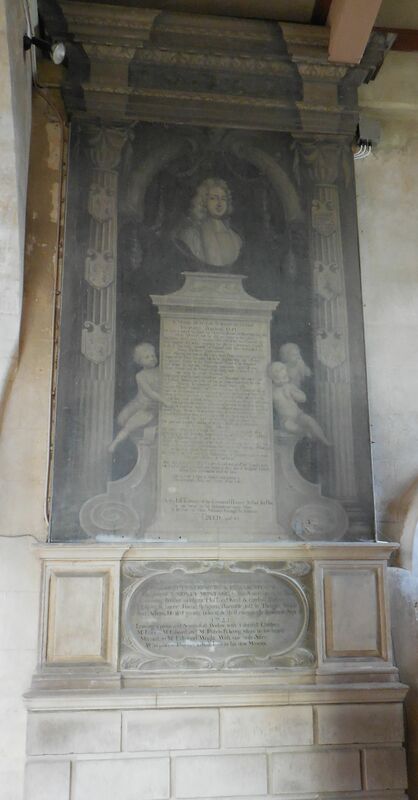 Sir Edward PICKERING 4th baronet, Member of Parliament, born 1714, died 3 July 1749, buried Titchmarsh. 1.1.1.1.1.1.1.1.2.1.1.1.1.1.1.1.5. Dorothy Elizabeth PICKERING born 1689, died 23 October 1766, buried Titchmarsh. Directed in her will that the Titchmarsh estate be sold after her death. 1.1.1.1.1.1.1.1.2.1.1.1.1.1.1.1.6. 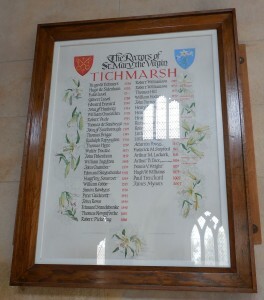 Frances PICKERING died 31 December 1764, buried Titchmarsh, married after 1749 Thomas BYRD. 1.1.1.1.1.1.1.1.2.1.1.1.1.1.4.2.1. 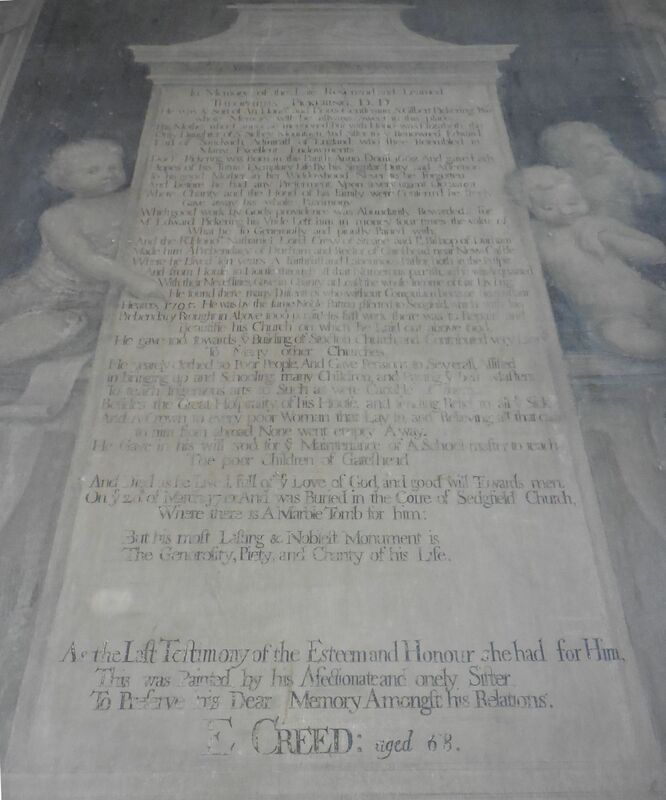 Sir Edward PICKERING 6th and last baronet, died April 1803, married 1776 Elizabeth GLASCOTT born 1745, died 1791. End of the Pickering baronetcy in Titchmarsh. 1.1.1.1.1.1.1.1.2.1.1.1.1.1.8.1.1. 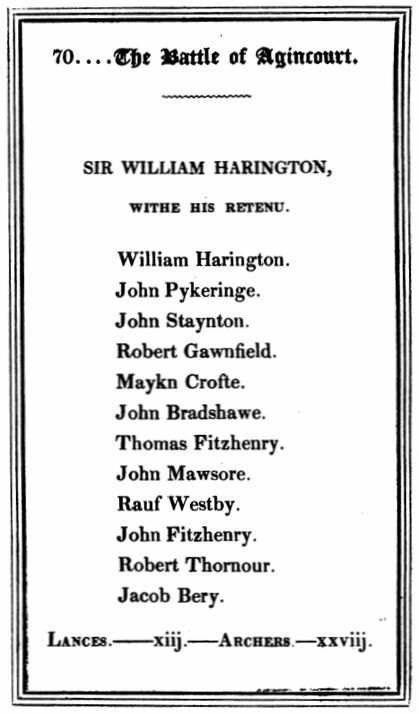 John PICKERING died without issue. 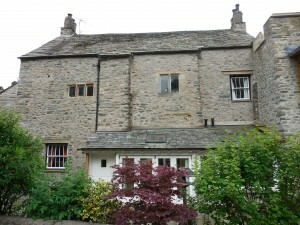 The spelling of the family name used throughout is Pickering, although various versions appear in the documents on which this tree is based.